(Phys.org)—Astronomers have detected a new low-mass eclipsing binary star in an open cluster named NGC 2632, better known as the Beehive Cluster (or Praesepe). The newly identified binary, designated PTFEB132.707+19.810, contains two late-type stars much smaller and less massive than the sun. The new findings were detailed June 28 in a paper published on arXiv.org. NGC 2632 is an open star cluster that looks like a hive of bees in the constellation Cancer. 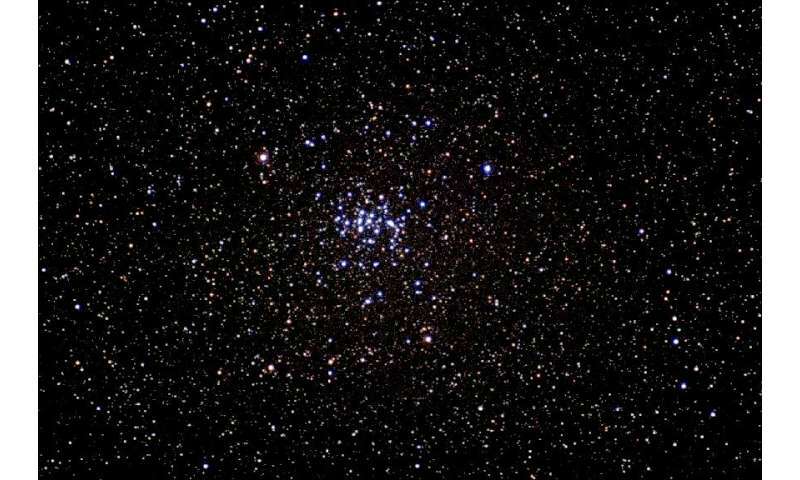 Located some 577 light years away, it is one of the nearest open clusters to the solar system. Due to its proximity, this cluster is the target of numerous observations conducted by astronomers searching for new objects, including eclipsing binaries. Such binaries could be very helpful in improving our known theoretical stellar evolution models. Recently, a team of astronomers led by Adam Kraus of the University of Texas at Austin, has detected a new eclipsing binary in the Beehive Cluster. Although PTFEB132.707+19.810 was identified in 2002, its true nature remained unclear until the research conducted by Kraus' team. The new study confirms that this star is a low-mass eclipsing binary. "We have discovered and characterized PTFEB132.707+19.810, a Porb = 6.0 day eclipsing binary system in the Praesepe open cluster," the researchers write in the paper. As noted in the paper, PTFEB132.707+19.810 has an orbital period of six days and comprises two late-type M stars. According to the study, the primary star has a radius of about 0.36 solar radii and a mass of nearly 0.4 solar masses. The secondary star is much smaller, as its radius equals approximately 0.27 solar radii. It is also much less massive—with a mass of 0.21 solar masses. These parameters indicate that PTFEB132.707+19.810 is one of the few low-mass eclipsing binaries to be found in an open cluster. The authors of the paper pointed out that given the masses of the components of PTFEB132.707+19.810, neither star of the system meets the predictions of stellar evolutionary models. "The primary star has the expected radius, but it is cooler and less luminous than models would predict, while the secondary star has the expected luminosity, but it is cooler and substantially larger (by 20 percent) than models would predict," the paper reads. Moreover, the scientists found that at least the primary star is not tidally locked to the orbital period. To obtain the parameters of the system, the researchers analyzed the light curve provided by Samuel Oschin telescope at the Palomar Observatory in California as part of the Palomar Transient Factory (PTF) survey. They have also analyzed follow-up spectroscopic data obtained by the High Resolution Echelle Spectrometer (HIRES) at the Keck Observatory, located near the summit of Mauna Kea, Hawaii, as well as the newly released light curve of PTFEB132.707+19.810 by NASA's prolonged Kepler mission known as K2. Theoretical models of stars constitute a fundamental bedrock upon which much of astrophysics is built, but large swaths of model parameter space remain uncalibrated by observations. The best calibrators are eclipsing binaries in clusters, allowing measurement of masses, radii, luminosities, and temperatures, for stars of known metallicity and age. We present the discovery and detailed characterization of PTFEB132.707+19.810, a P=6.0 day eclipsing binary in the Praesepe cluster (τ~600—800 Myr; [Fe/H]=0.14±0.04). The system contains two late-type stars (SpTP=M3.5±0.2; SpTS=M4.3±0.7) with precise masses (Mp=0.3953±0.0020~M⊙; Ms=0.2098±0.0014~M⊙) and radii (Rp=0.363±0.008~R⊙; Rs=0.272±0.012~R⊙). Neither star meets the predictions of stellar evolutionary models. The primary has the expected radius, but is cooler and less luminous, while the secondary has the expected luminosity, but is cooler and substantially larger (by 20%). The system is not tidally locked or circularized. Exploiting a fortuitous 4:5 commensurability between Porb and Prot,prim, we demonstrate that fitting errors from the unknown spot configuration only change the inferred radii by <1—2%. We also analyze subsets of data to test the robustness of radius measurements; the radius sum is more robust to systematic errors and preferable for model comparisons. We also test plausible changes in limb darkening, and find corresponding uncertainties of ~1%. Finally, we validate our pipeline using extant data for GU Boo, finding that our independent results match previous radii to within the mutual uncertainties (2—3%). We therefore suggest that the substantial discrepancies are astrophysical; since they are larger than for old field stars, they may be tied to the intermediate age of PTFEB132.707+19.810.